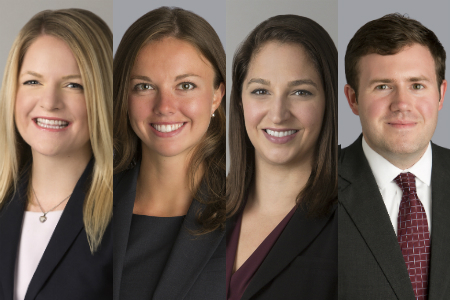 Gibson, Dunn & Crutcher associate Kaitlin Zumwalt (a second year) caught up with Washington, D.C. associates Anna McKenzie (a fifth year), Rachel Levick Corley (a fourth year), and Ed Patterson (a fourth year) to discuss their decisions on whether or not to clerk. Kaitlin: Anna, as someone who clerked immediately following law school, what did you find to be most beneficial about the experience and what were you able to bring from your clerkship to the firm? Anna: I found clerking to be a really good way to get a sense of how litigation progresses because it is basically a crash course on motions practice and the rules of procedure. Substantively, it has been very helpful that I clerked because I understand how courts, clerks, and judges think about legal disputes and questions of law in a way that I would not understand had I not clerked. Kaitlin: Rachel, as someone who worked for a year, left for a two-year clerkship, and then returned to the firm, what were you able to bring to your clerkship that those who go directly from law school to clerking might not bring? Rachel: Working for a firm, you develop a lot of skills as a practicing attorney that you may not have straight out of law school, including time management, organization, and experience interacting with and presenting to partners. You also gain substantive legal expertise and experience. You are able to bring all these skills and experiences into your clerkship. Kaitlin: Ed, as someone who decided not to clerk, tell us a bit about that decision. Ed: I didn’t consider clerking particularly strongly because, having worked before law school, I knew I wanted to get my career in private practice started more quickly. Everyone’s path is different, and if you make an effort with, for instance, your judge or your partner, or your client, you’re going to get potentially similar—and definitely very valuable—experiences that will make you grow in different ways. Kaitlin: It seems like the work-clerk-work schedule is a current phenomenon. Are there any negatives to doing this? Anna: A positive of clerking before joining a firm is that, when you get to your firm afterwards, you’re where you plan to be for the foreseeable future and can fully immerse yourself in the firm. When you come to a law firm for a year, and then leave and come back, you will inevitably have ramp-up and ramp-down periods that come with any leave. This means before your clerkship you can’t be staffed on big matters because you are going to leave, and when you come back you’re restarting your book of cases. Rachel: It was difficult to leave after just a year at the firm. I was just getting confident and comfortable, and then it was time for me to start my clerkship. 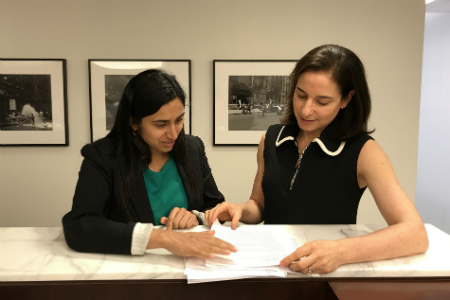 But, I entered my clerkship with a set of skills as a practicing attorney, including time management, organization, and experience interacting with partners that I might not have otherwise had. Given the realities of the clerkship hiring process, I think it is becoming more difficult to get a clerkship right out of law school, so I wouldn’t look negatively on working first before going to a clerkship. Kaitlin: It sounds like there are pros and cons for everything! Any thoughts on how your decisions have impacted you directly? Rachel: Clerking definitely had an impact on my career. My writing and research skills have improved exponentially. While clerking, you often have to advocate to your judge why you think an opinion or discrete legal issue should come out a certain way. That practice in articulating a legal position clearly and confidently helped me when I came back to the firm. Ed: Personally, I think everyone sort of ends up in the same place. By the end of two, three, or four years, you actually know quite a bit and you’ve derived that knowledge, experience, and skill from a host of experiences, whether or not you clerked. Kaitlin: Any final advice for people who are deciding whether or not to clerk? Anna: Having clerked is an extra affirmation that you’re a qualified and competent lawyer, but you still have to prove yourself regardless of whether you clerked or not. Ultimately, what matters is the quality of your work. Personally, I think the quality of my work is better because I clerked, but the advantages I’ve had in my career are not solely because I clerked. Rachel: Clerking and when to clerk is a really personal decision. There is no right answer or one-size-fits-all approach. Think about what is best for you professionally and personally, and where you want to be geographically. Ed: No matter what you decide about clerking, make sure to pick the right firm if you are going into private practice. Talk to people during your 1L or 2L summers about clerking, and about particular judges. If you want to make sure your first and second years are as productive as possible (and are thus most analogous to a clerkship), pick a firm that gives junior associates very substantive work early on in their careers. If you want to be exposed to a number of different legal issues, pick a firm that lets you shape your own career from the outset. Those are some of the reasons I chose Gibson Dunn. This is a sponsored blog post from Gibson, Dunn & Crutcher. You can view Gibson Dunn's Vault profile here.